It was only this past Sunday when it appeared that Jose Bautista had reached the end of the road in his storied 15-year career. Bautista, who turned 37 years old last October, was downright awful with the Blue Jays last season, slashing a paltry .203/.308/.366 with a career-high 170 strikeouts. He entered the free agent market and went unsigned until April 18, when the Atlanta Braves decided to take a shot on the veteran slugger. It seemed like a fine gamble by the Braves, but they weren’t signing Bautista to fill a void in the outfield or on the bench. No, actually, they were going to attempt to convert Bautista back to third base, a curious move considering he’d graded as a poor defender in the outfield in recent seasons. After spending a couple of weeks down in the minors, the Braves called Bautista up to see what, if anything, he had left in the tank. Well, they found out rather quickly that Bautista’s tank is running on empty these days. The Braves gave Bautista 35 at-bats and he produced the same lackluster results he did in 2017, slashing .143/.250/.343 with 12 strikeouts. Like any good organization would, the Braves cut bait with the veteran once they determined he couldn’t provide them any value. Instead of Bautista, the Braves decided to go with the young but unproven Johan Camargo as the starter at third, a decision that signified that the organization was not only focused on winning in the short term but also intent on giving young players a chance to develop. What a novel concept! 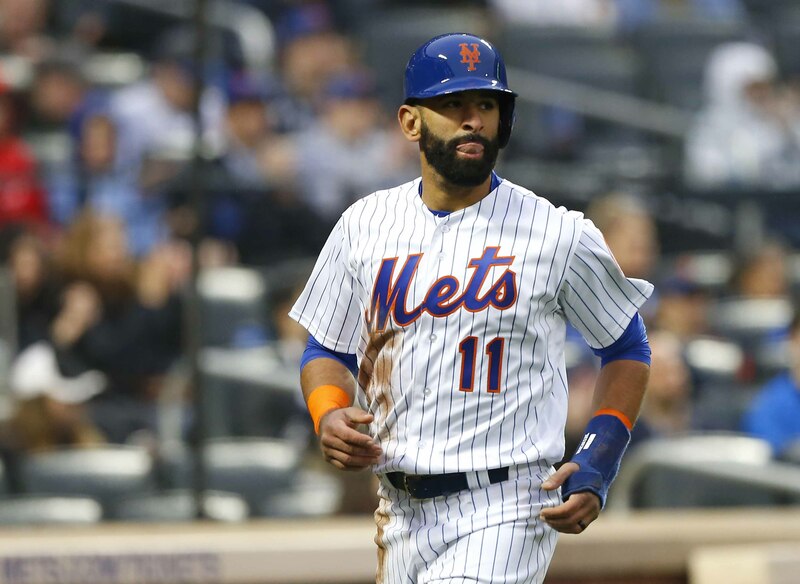 Now with the Mets being, well, the Mets, their “past their prime and cheap free agent” radar went off almost immediately after the Braves announced the release of Bautista. With Yoenis Cespedes on the DL, the club did have a need for a fourth outfielder, a void filled for the moment with a utility man who can’t really play the outfield in Phillip Evans. Evans isn’t good out in left but the Mets certainly didn’t need to make a move, except, well, they’re the Mets, and Bautista checked every box for the organization. Over the age of 34? Check. Could be had for the major league minimum? Yup! Hasn’t been good since 2016? Ding ding ding! Look, once upon a time, Jose Bautista was a really good player for the Toronto Blue Jays. He’s made six All-Star teams, hit more than 330 home runs and is closing in on 1,500 hits in his 15-year career. The dude even put up a 10.0 WARP season in 2011! Unfortunately, though, those days are long gone and Bautista just isn’t a major league contributor at this point in his career. We have more than 600 at-bats that prove that Bautista is now worse than a replacement level player. Fans and media alike are lauding this as a “low-risk move” but the reality is that couldn’t be farther from the truth. Roster spots, especially on the 25-man roster, are extremely valuable. The Mets currently have 12 position players on the active roster, eight of who will start in games, as well as four bench players. One of those bench players has to be a backup catcher, so that brings us down to three true bench spots. The Mets are choosing to use those three spots on a 36-year-old left-handed first baseman who can’t hit anymore, a soon-to-be 35-year-old who can’t hit or field any position even adequately and Jose Bautista. Does anyone else see the problem with that? If only the Mets were as good at winning games as they are at disappointing the fan base with repeated lousy signings that contribute no on-field value. It’s not like the organization doesn’t have capable young players either; in fact, they almost assuredly have better options in the minor leagues: Peter Alonso’s running a .475 OBP in Binghamton, Jeff McNeil is 26 and is slugging .715 in Double-A and, hell, even Phil Evans, who won a batting title in 2016, still hasn’t gotten an extended look in the majors. Competent organizations identify weak spots on the roster and work quickly to replace them. Take the Mariners, for example, who re-signed 44-year-old future Hall of Famer Ichiro only to remove him from the active roster after 44 at-bats. Ichiro’s a legend in Seattle and undoubtedly one of the greatest players to ever play the game, and that still couldn’t save his roster spot when his performance indicated that a move was necessary. Instead of sticking with the veteran to “see if there was anything left,” the Mariners chose to go younger in the outfield and give more opportunities to unproven players with potential. Then you have organizations like the Mets, who continue to employ Jose Reyes and now Jose Bautista at the expense of intriguing young players. Supposedly Bautista may not be long for the roster, but what if he starts taking away Brandon Nimmo’s at-bats? It’s not crazy, as we’ve already seen this with Reyes and Luis Guillorme. Not only do these decisions make the Mets a worse team in the present, but they also have future ramifications as well. How are the Mets ever going to know what they really have in these young guys if they never play them? There’s really no sugarcoating it: Jose Bautista is going to be bad for the Mets. There’s quite literally nothing here that indicates he’s going to provide any positive value to the ballclub. It’s quite likely his presence on the roster is going to cost the Mets a game or two. They weren’t forced to sign him or Reyes, they chose to. Remember that the next time they the Mets say they’re doing everything to compete, because it’s simply just not true. Nice piece, agree with all of it. Unfortunately, this is how the mets have operated for a long time. This is just the most embarrassingly and obviously wrong example of it. All the others could have been at least justified if the mets had, like a competent organization, cut bait when it obviously wasnt going to work out. (they didn’t.) I didn’t love the Reyes and Gonzales signings, but fundamentally I at least understood them. This one is just baffling in every single way, though. If they released all 3 of Reyes, AGon, and Bautista tomorrow, who would you most like to see called up? The reasonable candidates are Alonso, McNeill, Cecchini, Evans, and Smith. The only problem I see is that there isn’t a real outfielder among them, and 4th outfielder is a legitimate need. I’d keep Smith and Cecchini down, call up the rest. However its reasonable to let McNeill and Alonso to see AAA first, even though there maybe isn’t much they can learn in Vegas. Of course, the Mets would actually call up Zach Borenstein, Tebow, and a reliever.